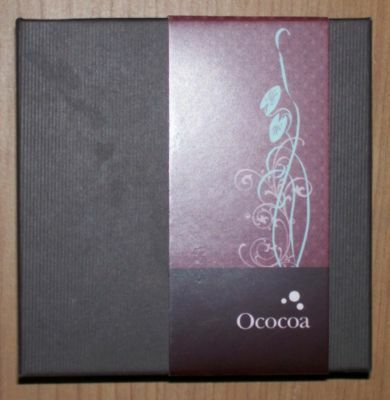 The list price for a 9-piece box of Ococoa chocolates is $22. I’m almost at a loss where to start reviewing each candy since they were all so very good. 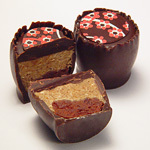 The Butter Cups all stand about 1.5 inches tall, taller than your normal boxed chocolate. They are all a crisp dark chocolate with, as I mentioned, various fillings. I like a soft chocolate, and these were a little too hard to bite into in my opinion, but many of the flavor combinations outweighed the extra crispness of the chocolate. I guess I’ll start this whirlwind tour with the Marzipan Truffle since it was the first one I sampled. If you’re not familiar with marzipan, you should go out tonight and find some somewhere. Marzipan is basically just ground almonds, sugar, and egg whites mixed to make a paste. It is a gourmet food that will set you back a pretty penny. I once bought a six ounce tube of it to use in a recipe for $6. It’s high quality stuff. Anyway, back to Ococoa’s Marzipan Truffle. On its top is a thin slice of almond drizzled with more dark chocolate. 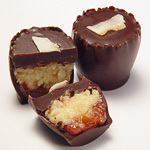 The inside contains two layers of marzipan with a layer of dark chocolate ganache between them. (I feel the need to admit that I had never heard the word ganache before.) The inside is creamy and light with a mild almond flavor. I actually would have liked for the almond flavor to be stronger, but my husband said he thought it was perfect. 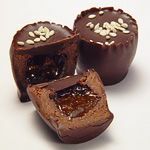 With little sesame seeds sprinkled over its top, the Sesame Fig Butter Cup is an unusual chocolate to say the least. A fluffy blend of dark chocolate and toasted sesame surround a gooey fig center. According to my husband, “If you like Fig Newtons, you’ll like this.” (He loves Fig Newtons, by the way.) Though the fig flavor is milder than that of a Fig Newton, it is still easily detectable and is well-balanced by the sesame. Mmm, cashew butter. As their price testifies, cashews are among the epitome of delicious nuts. 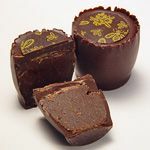 Ococoa’s Cashew Apricot is a dark chocolate cup filled with creamy cashew butter and a small amount of apricot in the bottom. The cashew butter is full-flavored and sweet and will satisfy any cashew lover. It blends well with the apricot without being overpowered by the fruit-flavor. 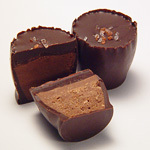 With a small hazelnut adorning its top, the Hazelnut Chocolate Butter Cup hints at its flavor before you even take a bite. It’s a simple combination of hazelnut butter and dark chocolate. Inside, I found it filled with the pure hazelnut butter and a bottom layer of blended chocolate and hazelnut. I’m a nut lover (or just a nut), and this was the first time I’d had a chocolate with hazelnut. I was quite pleased with the flavor combination. The texture of the hazelnut butter was basically the same as your standard peanut butter filling. The hazelnut on top gave a nice crunch to the otherwise creamy filling. Did I mention that I like nuts? Almonds are my favorite, especially when they’re covered with cinnamon and sugar. Ococoa has taken toasted almonds, turned them into butter, and combined then with cherries and dark chocolate. Mmm, excuse me while I melt… Okay, I’m back. The Almond Cherry has a candy shell on top, just like the Sunflower Honey, lending an extra crunch to the toasted almond. The cherry flavor is tart and may not be appreciated by sweet-cherry lovers. However, I think you’ll find that sweet almond, tart cherry, and smooth dark chocolate go very well together. Being the superb daughter that I am, I promised to save the Macadamia Guava for my mom so I can’t give a personal description of its flavor. I do know that it contains ground macadamia nuts and a bottom layer of tangy guava. On its top is a bit of coconut for an added flavor experience. Based on the rest of the Ococoa Butter Cups, I’m sure this one is an interesting and tasty flavor blend. 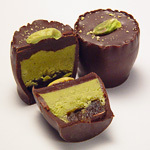 The Pistachio Date is unmistakable with the bright green pistachio on its top. Full of pistachio butter (I didn’t even know you could make pistachio butter) with dates on the bottom, this Butter Cup is another unusual but intriguing flavor blend. The pistachio butter is smooth and blends well with the dates while chewing. There’s a hint of coconut too. My four year old loved this one. 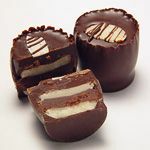 While I must admit that I can’t see myself paying $22 for a box of chocolates, I won’t hesitate to also admit that these elegant and unique Ococoa Butter Cups are worth their price. It’s important to remember that Diana makes these chocolates by hand. Each one really is like a little (edible!) work of art. 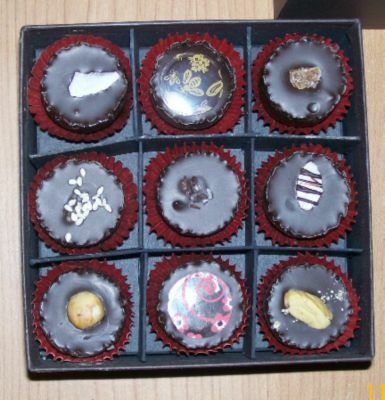 Any one of the Ococoa collections would make a nice gift for any chocolate lover. 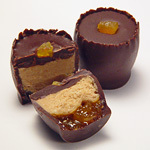 I was impressed with all of the Butter Cups, but I have an overwhelming need to award the Sunflower Honey and Classic Peanut Butter flavors the CandyAddict.com Awesomely Addictive Candy Award. I am so jealous you got to try these… i have seen these pics uploaded for a while and they looked so good that i couldn’t wait to read your review. these flavor combinations are brilliant. I wish I’d saved you one, Robby! Which one do you think you’d like the most? The one thing I wish Diana would do is allow customers to choose their own mix in the box. As in, I’d like to purchase a box with only Sunflower Honey and Peanut Butter Cup. Maybe someone else would like a box with just Pistachio Date. I would be happy to offer your readers their own custom box mixes. Simply place your order then when you check out, write what flavors you’d like in the Comments box. Great review, Cindy. Between the photos and your descriptions, my mouth was watering big time. These look like a great gift idea! Ohhh… I want the marzipan truffle,the hazelnut truffle and the classic peanut butter! Mom,Dad if u r reading this get me those 4 Christmas! Well…you got me hooked! And got lucky….I ordered 2 of the 16 piece boxes at Tada.com on sale for just today for $22!! I can’t wait to get them. Hope they don’t melt..live in Texas and it is still hot here!